by Erin Handley, Whole9’s Director of Operations, who has found that knowledge is always powerful, rarely ever easy, and can sometimes lead to the petting of small farm animals. I have recently been tasked with doing research for our upcoming Conscientious Omnivore post on pigs and pork. I thought I was already fairly knowledgeable and, well… awake when it came to making smart and caring protein choices. But dang, ya’ll, I have to admit, this project has been a huge eye-opener for me. I have been eating grass-fed beef and pastured eggs for a while now, but I’ve been pretty lax on other meat purchases for all the same reasons many of you probably have; cost, availability, and bold-faced laziness. However, after spending the past week or so reading about the atrocities of industrial pork production and realizing how completely detached I am from the animals that provide me health and sustenance on a daily basis, I decided it was high time for me to meet my meat. My motivation was to actually shake the hand of my farmer, as Melissa and Dallas have recommended for years. I also wanted to see firsthand the conditions in which the animals at the farm were being raised, and get a really good sense for the farmer’s relationship with these animals. I wanted to ask questions, touch the grasses these creatures are eating, and, um…maybe pet a pig or two? Ultimately I wanted to find a farm that I trusted so I could start bulk-ordering humanely raised, high-quality meat. So I set out to find a farm to visit. As it turns out, there are actually quite a few farms in Utah that provide pastured meat. I eventually chose to contact Utah Natural Meat because they were the closest to my home (a 30 minute drive) and they also raise pigs. As I mentioned, I’ve read a lot of nasty stuff recently about how nearly everything involved in industrial pork production is bad for the pigs, for people, and for the environment – so it was important for me to find a farm that produces humane and sustainable pork. Below you will find a synopsis of my experience, as well as our suggestions for the steps you should take if you, too, decide you want to shake the hand of your farmer and meet your meat. Step 1: Do your research. Most farms, especially ones that our readers would like to visit, have websites or Facebook pages, since they are small enterprises that benefit from the relative inexpensiveness of social media advertising. Eatwild.com has a fantastic directory of 1,300 pasture-based farms for you to search by state (there are even some Canadian and international options). Your local farmer’s market, grocery co-op, or health food store would also be a great place to start your research. Step 2: Contact the farmer. Farmers are very busy folks and, like most of us, prefer not to be dropped in on out of the blue. So, unless it states otherwise on their website, make an appointment to go visit the farm. Here is the email I sent to Kristen at Utah Natural Meat to set up my visit: “Hi! I am interested in ordering from you and would love an opportunity to visit your farm. I am trying to become more conscientious about the meat I purchase and eat and think it would be great to see your farm before I order. Is this a possibility?” Short and simple – and Kristen got back to me right away to schedule a time for me to swing by. The most important point here: you should be able to see where your food comes from. If the farmer you contact doesn’t allow visitors (without a stated reason, like, “We’re remodeling the farm for the next three months, call back again in the spring”), that should be a giant red flag for you, the conscientious consumer. Step 3: Be prepared. Don’t wear flip flops (uh, yah, I learned this the hard way…thank goodness I had an extra pair of shoes in my car), wear closed-toed shoes you don’t mind getting dirty. You also might want to avoid sporting your nicest frock. Oh, and be sure to wear long pants because, just a word to the wise, pigs like to root around, and your bare legs are fair game. Come with your list of questions and talking points, or print our newest free PDF download “Questions To Ask Your Farmer” and take it with you. Step 4: Get informed. Once I arrived at Utah Natural Meat, I was fortunate to be taken on a tour of the grounds by Shayn the Farmer (hopefully he doesn’t mind me calling him that). Shayn and his wife, Kristen, own and run this farm – all 900 acres of it – pretty much on their own. They are up at 6 am working to feed and care for their stock until 10 pm. They don’t take vacations, their young boys are great egg collectors, and they care immensely about the quality of life of their animals. I saw happy cows, pigs, fowl, and sheep everywhere I looked. All of the animals had plenty of room to roam and be…well…animals. The chickens could scritch-scratch the ground and take dust baths, and the pigs could loll in the sun or socialize as they pleased. I asked Shayn question after question and he earnestly provided me with honest answers. In fact, he is hungry for more consumers to be passionate about those things that he is so devoted to implementing at his farm. Shayn’s animals are grass-fed, but he recently started using a nutrient-dense, environmentally sound feeding system of greenhouse sprouted grasses*, which he can feed to his animals year-round (even in winter, when grass is non-existent). Shayn favors heritage breeds over faster-growing animals because of their quality. He cares more about the living conditions of his animals than he does about making a huge profit, which was evidenced by his “if we’re out of eggs, we’re out of eggs” philosophy. Shayn even takes his own stock to slaughter (this is important to me since transport in industrial farming operations is barbaric) and got a meat processor he trusted hired at a USDA approved facility. This person processes his meat exclusively so it won’t be tainted by other farms’ meat. And I discovered all of this in my short, 30-minute tour. 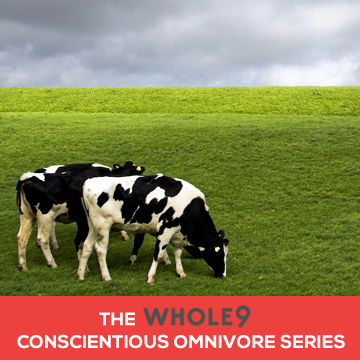 *In our grass-fed-centric community this may seem like a red flag – but it’s just another chance for you to do your own homework and weigh the pros and cons. After reading up on the benefits of the feeding system and taking all other things into consideration, we are fully in favor of this feeding strategy, and believe the animals at Utah Natural Meats could not be happier or healthier. Step 5: Make your decision. You’ve visited the farm. You’ve asked your questions. You should now be able to make a well-informed choice about where you want to purchase your protein sources. In my case, I was more than pleased with my visit to Utah Natural Meat and bought ground pork, ground beef, a pork roast, a whole chicken, country bacon and brats on the spot (no eggs though…they were out). I feel very comfortable with the way Utah Natural Meat raises and cares for its stock and it gives me great hope for the future of farming. And I promise I wasn’t even swayed in a positive direction by those little black and white piglets I got to pet. Have you visited your local farm? What was your experience? Share your story and suggestions in comments below. And don’t forget to download our free PDF, “Questions to Ask Your Farmer,” in preparation of your farm visit! Thank you so much for sharing Utah Natural Meats. I found them a few weeks ago and was very impressed with the quality of their practices and products. They also have a monthly beef slaughter which is very convenient for ordering in bulk, I don’t have to wait for the next season. I’ll be picking up my half a cow on Saturday. Another local farm I like is Paisley Farms. They’re new and smaller, but I’m hoping others in our community find them. Their pork is outstanding. I’m really pleased to find so many options in Salt Lake, finding good local organic gardens too. Yay for farmers! Love this one, Erin! Can’t wait to take my kiddos to pet some pigs! Glad you went out there Erin. This is where I have been getting my meat from. I love this farm. Tons of fun to meet those who are raising my food to eat. I need to schedule a time for a more extended visit with them. A little late posting, but this reminds me of an NPR piece I saw on how a vegan became a pork butcher. Now I know what a trotter is! Great video at the end of the article.